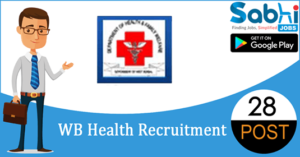 WB Health recruitment 2018-19 notification has been released on official website www.wbhealth.gov.in for the recruitment of 28 vacancies at West Bengal State Health & Family Welfare Samiti. The candidate who is looking for DEIC Manager can apply online application from 07th July 2018 and before 14th July 2018. Qualification Master in Disability Rehabilitation Administration approved by Rehabilitation Council of India with Bachelor in Physiotherapy or Bachelor in Occupational Therapy or Bachelor in Prosthetic Orthotics or B. Sc. Nursing or Bachelor in Disability Rehabilitation Administration approved by RCI. How to Apply Interested and eligible applicant may apply online through the website www.wbhealth.gov.in from 07th July 2018 to 14th July 2018.